The joint project by BMW Group, BASF, and other partners was a recipient of the “SPE Automotive Division Award 2013” for the Body Interior category. 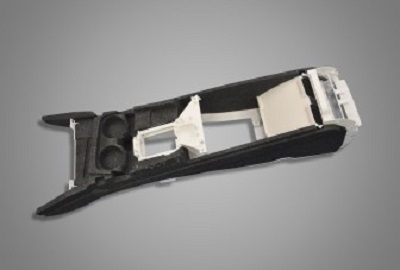 BMW Group is the world’s first car maker to use polypropylene (PP) foam as a visible contour material on an innovative center console, says BASF. Neopolen P foam from the German material supplier helps reduce weight by around 30% compared to the previous solution. Molding technology specially developed for this purpose now consists of only one single step. The use of Neopolen also allows additional functions to be integrated into the center console, for example, the molding process can already provide for ventilation channels for the air-conditioning system serving the rear of the car’s interior. BMW Group will be using this lightweight structural element in its cars in the future. As the next step, the automaker will be selecting the models for which the component will be part of series production. According to BASF, Neopolen P has good noise insulation properties, low weight, and high thermal resistance. This particle foam combines high energy absorption, even after multiple impact loads, with good resilience and isotropic deformation performance. Its property profile, which also includes low moisture absorption and good resistance to chemicals, opens up a wide range of applications in sectors from packaging and transportation to sport and leisure.